While how far up the wall you mount your window treatment might seem arbitrary, it's far from it. The placement you choose has the power to visually stretch—or dwarf—a room, so stick to these tips to achieve the best results. Q: I’m finally replacing my living room’s window treatments. But, in order to choose the right set and length, I need to decide how high to hang curtains. What do you recommend? A: The “right” height to hang curtains is largely one of fashion, not function, and fashions change over time. While it was once popular to hang curtains right over the top of the window, today, you are far likelier to see curtains placed several inches higher than that—the reason being that extra height can visually stretch your windows, making the ceiling seems higher and the space appear larger. If your windows are arched, bayed, or bowed, the answer is rather simple: Shades or cafe curtains hung on inside-mounted rods (those placed inside the window frames’ top corners) tend to look best. But when using wall-mounted rods to cover the standard window, you have more flexibility in how high you hang your curtains. The following interior design guidelines should help. Hang curtains at least 4 to 6 inches above the top of the windows. Assuming you’re outfitting a living room or bedroom with average ceiling height (8 feet high), an interior designer’s rule of thumb would be to mount the curtain rod about a half-foot above the top of the window frame—even higher if the total space between the top of the window and the ceiling line is less than 12 inches. This adds a lot of drama to a room. For high ceilings, keep curtains within 8 inches from the tops of windows. Rooms with high ceilings (10 or more feet high) often have more than a foot between the window and the ceiling line or no space at all. Both scenarios come with challenges. In one, raising the curtain rod more than 8 inches just because you have the space could look more awkward; in the other, you don’t have any room to play because windows that stretch all the way to the ceiling line. Your best move is to hang curtains within 8 inches of the top of the window frame. For very tall windows, which are popular in many modern homes, that means placing the rod as close to the ceiling as possible—in fact, you might want to install rods designed to actually hang from the ceiling. Reassess if you have arch or transom window depending on the amount of light and privacy you desire. Treat the transom and the larger window as one unit, and hang the drapes a 4 to 6 inches above the top of the transom. This provides the most privacy and shade but diminishes the drama of the transom. Hang the drapes just above the main window, leaving the transom uncovered. This lets in more light and shows off the architectural detail, especially in the case of arched transoms. Know that this setup isn’t always practical if privacy is an issue. How high you hang your curtain impacts the length you’ll need. Puddling is best reserved for drapes that stay open since you’ll have to restyle the fabric each time you move them. An extra 1 to 3 inches of length gives a pleasing puddle of fabric, while an extra 6 inches of fabric creates a glamorous pool. Curtains that just touch the floor, or are no more than ½-inch above it, are best for active windows. Sometimes, it isn’t possible or desirable to hang curtains all the way to the floor. Perhaps you have a radiator or very deep windowsill, or maybe your couch or another large piece of furniture needs to back up to the window. In these situations, go ahead and hang curtains that either touch the windowsill—this is the common length for café windows hung over a kitchen sink—or drape down to right above the radiator or other obstruction. While you’re at it, mount curtain rods to extend 3 to 6 inches, or more, past either side of the window frame. Height isn’t the only number that affects the impact curtains have on a room. Just as you want to raise curtains to draw the eye up and make a room appear taller, you’ll hang your curtains 3 to 6 inches past the window frame to make the window itself appear larger. If your windows are trimmed with decorative molding, however, feel free to space the curtains even further to show it off. Limit the length of your curtain rods to no more than one-third wider than the width of the windows. For example, on a 54-inch-wide window, you could extend your curtain rods up to 9 inches on each side (54 divided by three equals 18, so your rod can be up to 72 inches long). 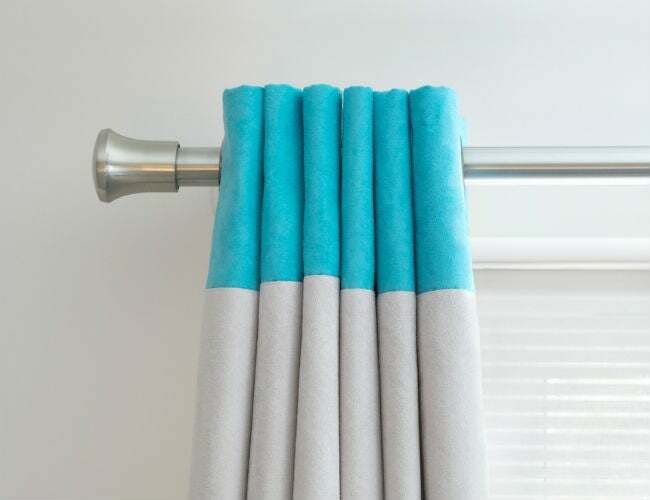 Remember, though: The longer your curtain rod, the more fabric it takes for the curtains to drape attractively when closed. Plan for the combined width of your curtain panels to be between two and two-and-a-half times the width of the window so that you have enough fabric for fullness.